Using Kinnek presents a new mode of operation for most suppliers, and they often ask what they can do to be more competitive on the platform. In attempting to answer, we'll start by considering issues of time. How does a supplier’s timing affect their performance? We'll first ask the the same question studied by email marketing PhDs since the advent of the internet: is there a particular time of day when one's actions are more likely to get noticed? To answer that question, we bucketed each day into 4-hour-intervals beginning at midnight. 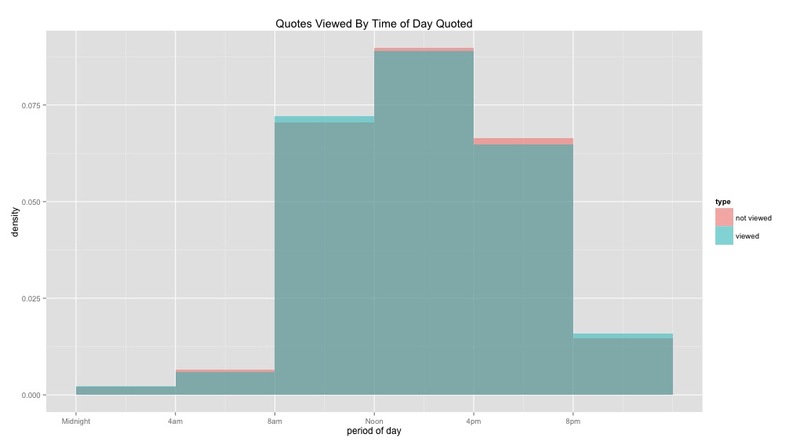 Then, we studied the difference between quotes which a buyer viewed vs. quotes that same buyer ignored based on the time of day that a supplier submitted them. As expected, overall activity seems to vary throughout the day. However, there doesn't seem to be a particular span when those submitted quotes are more likely to get lost in the riff-raff of a buyer’s day-to-day operations and therefore, get ignored. Nevertheless, early morning and late evening (presumably calmer periods for many businesses) do appear to have a slight advantage. Now, how about day of the week? Does that make a difference? Is Friday a buy-day? We examined the same data, but this time filtered it by day of the week. Looking at the graph pictured right, you might be tempted to wait until Tuesday to submit a quote rather than doing so on a Monday - but fight that urge! I know you can! And here's why: About ⅕ of the quotes submitted on a Monday were ones requested on that previous Friday. 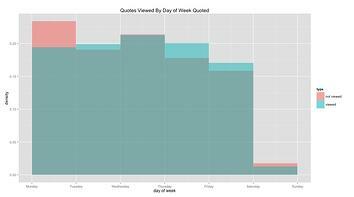 The majority of those "ignored quotes" on Mondays are the result of that weekend gap, when there isn't much activity at most small businesses. And for these requests, quotes submitted on the Tuesday after instead of the Monday are have a slightly lower overall chance of being read. So, delaying isn’t the answer - which begs the question: how long is too long to quote? Let’s consider the period of time between when a supplier receives a quote request and when the actual quote is submitted. 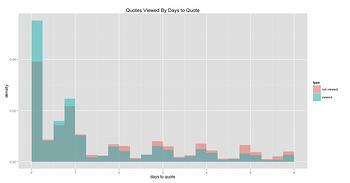 As you can see on the histogram to the left, the first week after a quote is requested is plotted in 6-hour-incredments. Now we’ve really got something to talk about! Please note the significant difference in distribution between viewed and unviewed quotes within the first 6-hours of the supplier receiving it. In fact, suppliers who quote at any point in the first 24 hours appear to have a significant advantage overall. But you don’t want to just be told you’re pretty - you also want to be asked to dance, right? Which begs the question - do all of these factors actually aid the supplier in ultimately getting a purchase? Indeed! As you'll notice in the graph on the below, winning quotes are even more likely to be created by suppliers in the first 24 hours after they receive the request than simply viewed quotes. Now, as pretty as these graphs are, histograms are somewhat sensitive to binning - so let’s take a look at some of the numbers in order to make these conclusions a little bit more concrete. Considering our distribution is pretty skewed, we’ll examine median time suppliers take to quote from when they actually receieve a buyer’s request. Winning quotes had a median quote time of 17 hours, compared to the baseline median for all quotes, which was 24. That makes the median time to quote almost 30% shorter for winning quotes! The dispersion of winning quotes is smaller, as well. The median absolute deviation, a measure robust to the outliers of our spread, was 22 hours for winning quotes - versus a baseline median of 34 for all quotes. That means that winning quotes are not only faster - they’re more consistent too. Now, it’s not surprising that time to quote plays an important role in determining the overall likelihood of whether or not a quote is successful. What is surprising is the significance of that first day - after that, winning quotes have a lower density in almost every single time-bracket in the first week. We know that time can’t be the only important factor though, which is why we’ll be looking at the effects of other variables and their impact on one another in the coming weeks. Subscribe to our blog to get the latest Kinnek news. The good news is, while time might not be your friend, Kinnek certainly is! Discover why today.